Customers often ask us about the scalability and throughput limits of the consumption plan for Azure Functions. The short answer is always “it depends, what does your workload look like?”. Today I want to talk about running high scale Event Hub/IOT Hub workloads on Azure Functions and some key points to be aware of in order to maximize the performance you get from the platform. The load generator, also running on Functions, writes batched messages to an ingestion event hub. These messages represent a set of readings from a given sensor. Functions picks up messages from the ingestion event hub, extracts individual readings from the batch, and writes them to the target event hub augmenting the messages with additional telemetry along the way. Two more functions within the same function app on the consumption plan each process the individual readings and send aggregated telemetry to App Insights. Azure Functions has two built in monitoring solutions, the WebJobs dashboard and Application Insights. Integration between Azure Functions and App Insights is currently in preview. The dashboard was designed with longer running jobs in mind and isn’t optimized for scenarios where there are 10,000 plus function executions happening per second. Fortunately, App Insights is an incredibly robust telemetry system and we’ve made sure that it works great with Azure Functions in high scale scenarios. 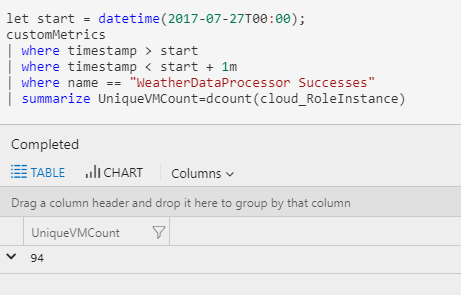 Turning on App insights is really easy, just add your instrumentation key to your function app and Azure Functions will start sending data to App Insights automatically. For more info read the blog, "Azure Functions now has direct integration with Application Insights." See below for additional details on each of these. This approach to exception handling is important if you want to ensure you don’t lose or skip messages. Typically you’ll write your exception handler so that it stores the event that failed for later processing and analysis. This is important because Azure Functions does not have any built in dead lettering for Event Hubs. As mentioned above, because we were using App Insights for monitoring we disabled the dashboard. To do this simply go to your application setting and remove the AzureWebJobsDashboard setting. Azure Functions uses the EventProcessorHost provided in the Event Hubs SDK to process event hub messages. For more information see our documentation, "Programming guide for Azure Event Hubs." The way EventProcessorHost works is that each VM running your app acquires leases to some of the partitions, allowing it to process messages on those partitions. This means that if your event hub has only two partitions, only two VMs can process messages at any given time i.e. the partition count puts an upper limit on the scalability of your function. The event hubs programming guide has a good summary of partition keys and when you might want to use them. This scenario had no ordering or statefulness requirements so events were generated without partition keys. This increased the overall throughput and availability for the run. If you’d like to see the .proto file used for this scenario see the Protocol Buffers example in GitHub. This data does not include the cost of the load generator and Event Hubs as no effort was spent on optimizing these. The Azure Storage cost is based on approximately 50 million transactions per hour. Almost all of these transactions are related to Event Hubs checkpointing. The Application Insights cost is based on 450mb of data ingestion per hour. The consumption plan for Azure Functions is capable of scaling your app to run on hundreds of VMs, enabling high performance scenarios without having to reserve and pay for huge amounts of compute capacity up front. To learn more about Azure Functions and building cloud applications on serverless technology, start on the Functions product page.